PetitPoix: All Participants Win in the Petit Poix Contest! All Participants Win in the Petit Poix Contest! Patterns available on Etsy or Craftsy. Take this opportunity to win publicity for your website, blog, online shop, YouTube channel, charitable cause or other website of your choosing. All participants in the Durag/Hat contest and the Tailored Pet Coat contest will have their entries published in our contest gallery and linked to the URL of your choice. This could be your website, online shop, blog, YouTube channel, charitable association or any other URL. Choice of a either a Visa Gift Card or a paypal credit for USA $30. Create a hat or durag using the Tommy Sotomayor Designer Durag pattern available on Etsy or Craftsy. Send up to 5 pictures of your creation shown from various angles for judging. Please email them to petitpoix@gmail.com and include your full name, email, phone number and full address, city, state and country where you live. All entries will be uploaded to our contest gallery within 24 hours of the contest deadline which is May 31, 2015. (Entries will not be uploaded before that date to avoid copying between participants.) Winners will be notified by email by June 14th, 2015 and posted on this blog. If you would like your entry linked to another website - such as your online shop or blog - please provide the correct url address along with your entry. The entries will be judged 50% on originality, 25% on pattern transformation and 25% on photography. Since we will only be judging from photographs, your sewing skills (or lack thereof) will not affect the final score. Your email and phone number will not be used for future purposes nor shared with any other entity. See the video tutorial for how to use the pattern. A phone call with Tommy Sotomayor himself during his live show "Your World, My Views" where he will introduce you as the winner of the competition and shout out your online shop, blog, YouTube channel, charitable cause or any other cause of your choosing. The live broadcast runs three times weekly and maintains a very large and loyal following. A free 250x300 banner link placed in a prominent location on petitpoix.blogspot.com and linked to the website of your choice for six months. A blog post on petitpoix.blogspot.com, also with direct links, about your online shop, blog, YouTube channel, charitable cause, or any other url of your choosing. This post will be reviewed and approved by you prior to publication. A free 250 x 300 banner link in a middle spot on petitpoix.blogspot.com for 6 months. For example this could be a linked to your online shop, your YouTube channel or your personal blog. 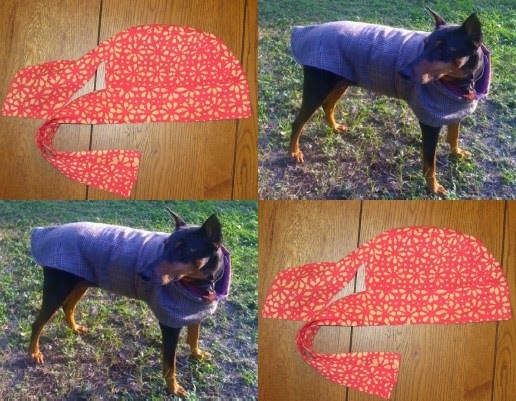 Create a tailored pet coat any size using the PetitPoix Transformable Tailored Pet Coat Pattern available on Etsy or Craftsy. Send up to 5 pictures of your creation shown from various angles for judging. Please email them to petitpoix@gmail.com and include your full name, email, phone number and the name of the city, state and country where you live. All entries will be uploaded to our contest gallery within 24 hours of the contest deadline which is May 31, 2015. (Entries will not be uploaded before that date to avoid copying between participants.) If you would like your entry linked to another website - such as your online shop or blog - please provide the correct url address along with your entry as well. The entries will be judged 50% on originality, 25% on pattern transformation and 25% on photography. Since we will only be judging from photographs, your sewing skills (or lack thereof) will not affect the final score. Your email and phone number will not be used for future purposes nor shared with any other entity. A two minute YouTube video by PetitPoix shouting out your online shop, blog, YouTube channel, charitable cause, etc. A free 250 x 300 banner link in a middle spot on petitpoix blog for 6 months. For example this could be a linked to your online shop, your YouTube channel or your personal blog. Note: You may enter both contests, but only once in each. Deadline: Midnight (USA Eastern time) May 31, 2015.